Anima Designs best sellers! These are tiny brass book label holders in a package of 10. (See photograph for card size) Perfect for smaller projects . 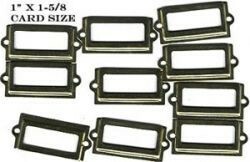 . . these come without the escutcheon pins but can be easily attached to most paper projects using mini brads or eyelets.